If you ever go to the airport in Manado, North Sulawesi, you might notice one aspect of the terminal that sets it apart from all others: the stained glass windows. When the first rays of the morning sun pour into the terminal, the sight can lend it the air of a sanctuary. And it certainly is one after the scariest flying experience you remember. Our time in Manado was meant to be a momentary stop before the hour-long flight to Ternate, but the runway there was being hit by severe crosswinds – the pilot of our propeller plane had tried valiantly but failed to land twice. Once we touched down again in Manado, Bama and I were so relieved we could have kissed the hard tarmac. As we waited in the baggage reclaim area, a tall, lanky man with shaved patterns on his head confronted an airline representative. “We are transiting from Jakarta!” He screamed. I wanted to tell him there was no point in being angry, and that the bad weather was not the airline’s fault. I also wanted to tell him we had just spent a sleepless night in Jakarta’s main airport after flying in from Padang, West Sumatra. The airline eventually pacified us all with a free snack box, and then we got the news that our flight to Ternate was postponed till the next morning. It was a surreal experience, travelling towards a nearby hotel in a bus typically used to ferry passengers to a waiting plane on the tarmac. We checked in, completely exhausted, just after five in the afternoon. Bama and I had left our hotel in Sumatra at 4:00pm local time the previous day. Since Manado is one hour ahead of Java and Sumatra, that meant the last 24 hours were spent in transit, with no shower, no bed to sleep in, and no proper meals. We weren’t in Ternate as planned, but at least we could have our fill of all three. They say hindsight is 20/20, and Bama now tells me our hiccup in Manado was a blessing in disguise. He’s right. Our original plan was to stay three nights in Ternate, then take a 45-minute speedboat ride and a four-hour drive to the small town of Tobelo on the neighbouring island of Halmahera. While in Manado we decided to simplify the itinerary and save Halmahera for a future trip, in favour of an extra two nights in Ternate. 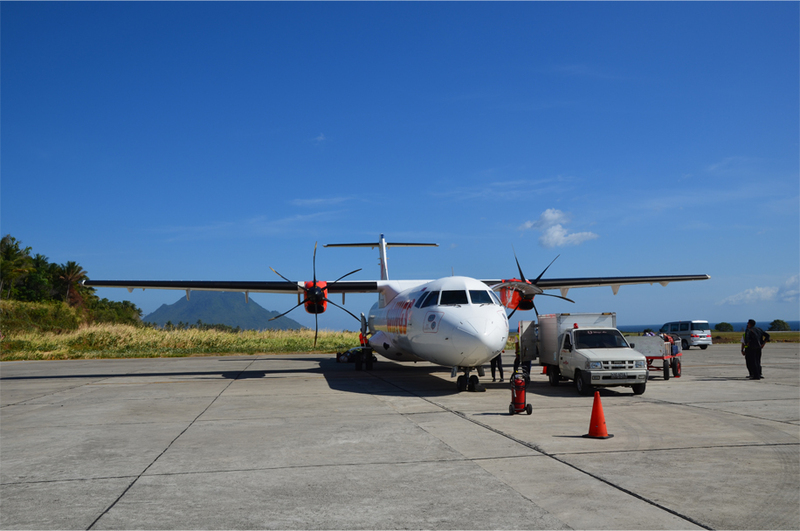 *The photo shows our plane on the tarmac in Ternate. Sadly I was too sleep-deprived to take pictures of Manado airport’s stained glass. It makes you wonder doesn’t it, if some people have any sense, after what must have been a grateful landing. I’ve been to Indonesia three times but feel only seen the tip of the iceberg – such a vast network of islands. Never did get to Salawesi though I’ve been tempted. Darn! I missed the stained glass in Manado. I’ll have to go back. 🙂 How cool that you’re loving Ternate! Sounds like a wonderful discovery. So excited to be traveling along with both of you as you uncover places like this! The challenge of every good blogger!! Hope you guys are having a blast! Very cool. Often times in travel the unexpected changed lead to some of the best experiences. I am jealous that you are getting to see so much of Indonesia! And I am jealous that you are heading to Mexico later this year – that is so far away for those of us based in Asia! I know I would love the historic sites (especially Mayan temples), the spicy food and the scenery there. We get so used to things working (almost) like they’re supposed to … it’s always kind of fun (in hindsight!) to be forced away from our plans on occasion! Oh yes, I agree about spontaneity being fun, even if we are left with no choice sometimes! I used to plan everything down to a tee but travelling for the past two months has really taught me to let go. I think this post would have come out differently had I scribbled it in Manado! You are so right – sometimes we forget to embrace the unexpected in our daily lives. It is all too easy to settle into a routine existence! I got some kind of weirdly ill on Sulawesi years ago. Thought I was going to die. Then I went to one of those funerals they hold there…that was really weird. Good thing you recovered – did you ever find out what it was? I’m heading to Sulawesi in a couple of days. It might not be funeral season any more in Tana Toraja but we shall see. At first I thought it was malaria, but the temperature and delusions only lasted a few days, so…no…don’t know what it was. Unless malaria does that. Awesome read, sounds like quite an adventure! Thanks! It was an unforgettable episode.